Last week my daughter busted on me, saying that we had no right to celebrate Thanksgivingkuh. We’re not even Jewish, she said. She’s technically correct since my mom’s family hailed from the Baltics. And as for my dad’s side, it’s a mystery. After my dad died, my paternal line was largely lost to me. I have vague memories of information that my grandmother had once shared. A Max Lewis, the last name Barsh. Time spent in Camden. They amounted to the barest shreds of a long disintegrated family fabric. Last week, during a bout of sleeplessness I paid a visit to Ancestry.com. It makes sense. What else should one do during a dark night of the soul? Isn’t it all about uncovering who you are? Lying there in the darkness I entered a few bits of information: my name and birth date, that of my parents. Within minutes little “hint” leaves began popping up left and right on the tree that was self assembling. My dad’s birth certificate led to the names of his parents. His parents’ birth and death records auto populated and led to 1910 and 1920 census records in Philadelphia and Camden, New Jersey. These led to names of cousins and great grandparents and possible countries of origin. 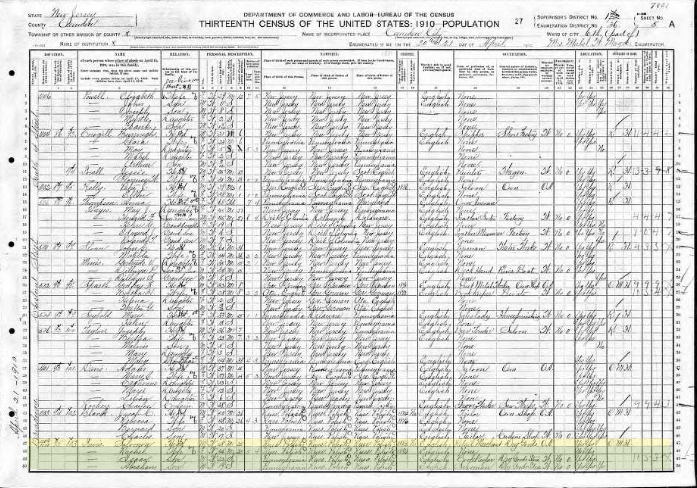 In the dim illumination of my computer screen, I stared at images of reports handwritten by census workers in 1910 as they trudged up and down soiled tenement stairs, inventorying the names and occupations of my ancestors. I saw the names Isaac and of his brother Max and of their father and mother, Solomon and Rachel, bearers of ancient biblical names, but recently hailed from Poland and Russia. What did they know of their great grandson of the future who would use 21st century magic and technology to pull back the veil of the past to reveal some distant home? On that day in 1910, they sat impatiently in some squalid and small flat, answering a stranger’s questions in broken English. We left that place, they may have said to themselves. It was done and over. And of this, what good would ever come of it? This entry was posted in The Boat and tagged ancestry, Ancestry.com, Andrew Lewis, diaspora, geneaology, Isaac Lewis, Lewis family, Max Lewis, Poland, Rachel Lewis, Russia, Solomon Lewis by Andrew Lewis. Bookmark the permalink. Michael, who loves computer research, recently explored my roots on ancestry.com for a school project, and helped solve the mystery of my maternal grandma’s family, totally lost to me until now. It was amazing to imagine the army of New York City census workers and all they must have seen. The bits of data I saw suggested family stories, corrections of family lore and even scandals — entertaining to contemplate. I have one orphaned great, great grandfather born in 1828 in Northumberland Co. PA. My sister and I have been digging for info for decades and can’t seem to get anywhere. It seems he changed the spelling of his surname along the way. He most likely is Swiss, not German as we grew up thinking. I wish I could read every single newspaper from the county from 1828 until 1835 when he was taken in by another family and moved a couple counties away.